You are feeling overwhelmed. You watch the tiny home shows on HGTV and dream of a simpler life. 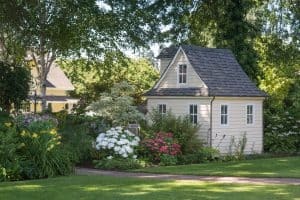 Is it time to downsize your home and live in a smaller place? Maybe, only you can decide that for yourself. But a near term alternative might be to rightsize your possessions and organize your current space in a way that is more restful and makes your life better. There are many books and methods to go about this process. The idea is that if you are going to downsize and live in a smaller place, you will need to organize, sort, toss, or donate a good portion of your things anyway. That is, unless you plan to stash them all in storage, which pretty much defeats the purpose of simplifying your life. In Marie Kondo’s The Life-Changing Magic of Tidying Up she suggests that you keep nothing that does not “spark joy” for you. That can mean something ordinary, such as a screwdriver that you appreciate for its usefulness, as well as something lovely that serves no purpose except the spark of joy. As you consider all your possessions, you might use this benchmark to determine if you should keep something. The idea of rightsizing is not to get rid of a lot of stuff because it’s better to have less stuff. It is to get rid of what does not add something to your life, to leave more space to fill your life with what you really want. That is true of possessions, as well as things that take up your time. If we all filled our days with what we have passion for, and bring that passion as we go through our day, imagine that! Once you have rightsized, you may realize that you have simplified your life and don’t really want a tiny house. Perhaps you want to find a home that provides different (not necessarily less or more) space for gathering with people that are important to you. Or a home filled with light! Life is short. Fill it with what resonates with you!